Since the begining of this adventure I have wanted to share all of the information I have about the meteor event and the possible where abouts of the meteorites. A lot of very brilliant people have worked hard to aquire and analyze all of the data used to project the path and determine the impact point and the possible strewn field location. Rob Matson a scientist and meteorite enthusist compiled and analyzed the data and wrote a computer program in Fortran to create a 3D model of the Mason Dixon Meteor. Rob has been sharing his data with me for a few weeks now and I asked him yesterday if it would be ok to make the information public. He agreed that making all of the information publicly available would greatly increase the chances of recovering the meteorites. I would like to express my sincere gratitude and thanks to all of the people that worked hard to help Rob develop this model including: Marc Fries, Dirk Ross, Elton Jones, Steve Arnold, Ruben Garcia, Eric Whicman, Mike Antonelli, Derik Bower, John Divelbiss, Safe Harbor Power Corp, York Water Company, Alison Kruse and everyone else that helped with this (lmk if I forgot about you and I’ll add you to the list). You have my okay on it. I would reiterate Marc’s comments that my modeling predictions are only as good as the information that goes into them. But that said, the current information is unusually good for a fireball; in particularly, I don’t know of any previous bolide that was serendipitously observed by a telescope. Here is a Google Earth movie that illustrates the Mason Dixon Meteor’s 3D model. I will be posting detailed search maps as well as Marc Fries proposed strewn field map in the days to come. Earlier last week I was reviewing the estimated meteor path on google earth and noticed the Safe Harbor Dam & power plant was very close to the current trajectory. I wrote the dam and asked them to review their security tapes from that night. They were nice enough to review and found two tapes that captured a light flare at 1:04:45 AM. The manager copied the tapes for me and I picked them up yesterday. After viewing the tapes on sight I surveyed the dam and camera locations. I do not have permission to publish the videos yet, but if you are interested in seeing them you can email me and I can send you the files privately. The videos do not show the main body, but they do show an awful lot of light and some distinct moving shadows that can be tracked for about 4-5 frames. After reviewing the videos and site I have currently made the following conclusions based on this new information:1) the meteor flew very close to the Safe Harbor Water Power Corp 2) the meteor flew most likely on the southern side of the plant. 3) The meteor made it across the Susquehanna. 4) The meteor was visible for 3 1/2-4 seconds. I believe if the right people look at the video and examine the shadows on the ground they will be able to make some conclusions about the location of the meteor at that moment and the direction it was traveling. If you want to review the video please leave me a comment or send me an email. 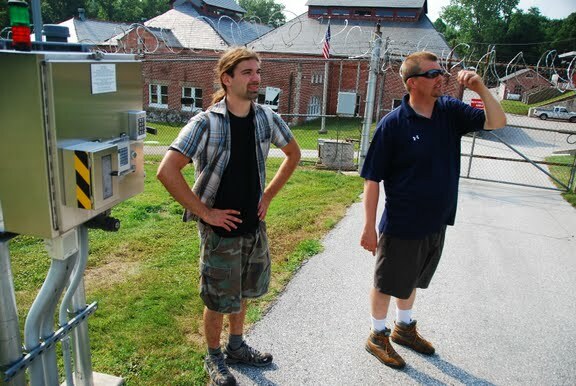 While I was at the dam I met up with Mike O’Neil and John Stevenson, two graduate students from John’s Hopkins who are working on the meteor search as part of a project with the applied physics department. Mike and John were incredibly helpful in surveying the power plant as well as providing lots of analysis and insight into the event, the trajectory and possible crash site. Many thanks to Mike and John, I look forward to reading your reports. 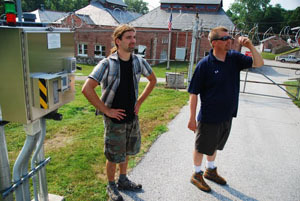 After the Safe Harbor survey we decided to go back to the location of the first video tape — York Water Company. None of us had personally been there yet. We had access to the data from that site and were under the belief that the meteor was on a eastern trajectory from that point, but we all wanted to see the site first hand so we could get a better idea about where this thing was going. I had the coordinates already so we plugged them into the GPS and headed over there. It took us a few minutes to locate the camera (its pretty sneaky). The camera is mounted under the silver electric box in the picture to the left, its the circle underneath. It took us a few minutes to figure that out but we had all remembered seeing that box posted in a previous picture and by looking at the site we eventually put two and two together. John and Mike both work for a company that makes GPS devices and software so they are pretty knowledgeable about surveying sites and engineering in general. They explained to me the best way to determine the line of sight (LOS) and direction is to look for big objects on the ground and then find those objects in satalite photos like google earth or microsoft bing. Then use the NSEW directional markings in the satellite photo relative to the objects on the ground and not a compass, the sun or some other mechanism to evaluate the LOS direction. 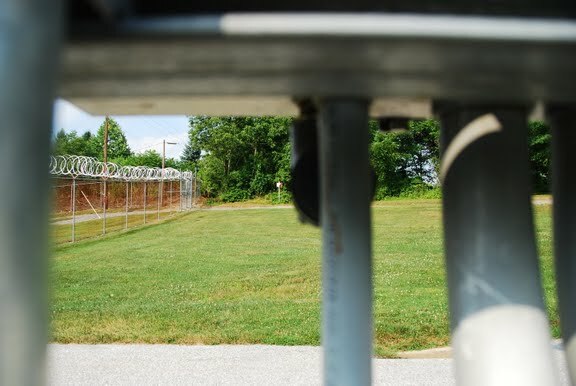 As you can see in this picture, the camera is roughly parallel to the barbed wire security fence on the left. Prior to talking to John and Mike I was under the belief the meteor was traveling due east from the York County video (based on information from other sources) but was still having trouble accepting this, because I saw it in Freeland 20 miles south. This is what Mike wrote me today regarding the trajectory relative to York. Now I am working on analyzing the shadows in the Safe Harbor video. I created a simple experiment today with some legos and an illuminated light bulb.With the legos I tried to re-create a fence in the video that cast’s shadows. I then used the lightbulb in a dark room and ran it accross the model in different directions until I found what seemed to most closely resemble the shadow patern I saw on the video. My preliminary analysis leads me to believe the meteor just barely clipped the end of the main damn / pier at a 30-40 degree angle. Heading E/NE.